Eastern black swallowtail butterflies are found in the Midwest and eastern United States as well as Canada, Mexico and Arizona. They prefer heavily wooded areas and frequently visit local gardens to feed on plants. These butterflies are completely black. Males exhibit yellow dots on their forewing and hindwings, while females possess blue dots. Watching an eastern black swallowtail butterfly emerge from its cocoon can be a memorable experience for the whole family. Eastern black swallowtail eggs are small, round and cream or yellow in color. Butterflies lay their eggs on a variety of plants including Queen Anne’s lace and Texas turpentine. 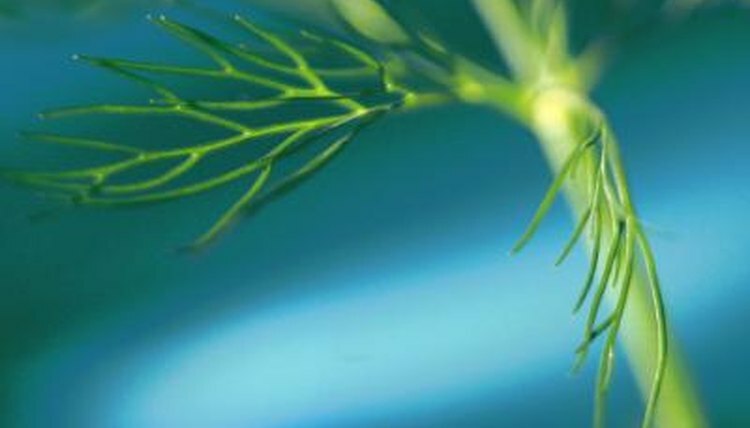 They are attracted to domestic plants including dill, parsley and fennel. Plant these herbs in your garden to attract egg-laying butterflies. After locating an egg, gently remove the leaf and place it in a small container or jar. Keep the jar away from direct sunlight. Wait 11 to 13 days for your caterpillar to hatch. If the egg is laid in a potted plant, bring the plant indoors to prevent unnecessary disturbance. If you allow your caterpillars to hatch outside bring them indoors shortly afterward to protect them from birds and other predators. Keep your caterpillars in an enclosed environment to prevent them from wandering or getting stepped on. A fish tank or aquarium can make an ideal home. Other options include a glass or plastic container or even a cottage cheese jar. Poke holes in the lid for ventilation. An eastern black swallowtail caterpillar will shed its skin four or five times. Provide plenty of food to help your caterpillar grow and develop. Feed Queen Anne’s lace, parsley and fennel. Keep plant leaves in water to prevent them from drying out. As your caterpillar grows offer fresh leaves three or four times per day. Allow your caterpillar to crawl onto a new leaf before removing the old one. Keep the container clean by removing droppings. Once your eastern black swallowtail caterpillar has reached 1.5 inches in length, he will form into a chrysalis where he prepares to emerge as a butterfly. Place several twigs or sticks in your caterpillar’s habitat so he can attach and spin his cocoon. Your caterpillar will hatch into a butterfly within 18 to 20 days. His wings will be extremely soft and will need several hours to dry before he is ready to fly. Release your butterfly outside within two days of hatching. You can feed your butterfly by soaking a paper towel in honey water. Mix one part honey and 10 parts water. If you want to keep your black swallowtail around after releasing him, plant various flowers in your front yard. Black swallowtails prefer to feed on phlox, milkweed and red clover. If your eastern black swallowtail goes into chrysalis after September, he will not hatch until the following spring. Special care is required to keep the chrysalis safe so a beautiful butterfly can be born. If you keep the chrysalis in your home, make sure there is adequate humidity and ventilation. A dry environment can cause the chrysalis to die. You can keep the chrysalis outdoors in a protected container. The container should have screen on all sides to promote ventilation and keep away predators such as birds, mice and ants.